Tess Munster, aka Tess Holliday, has made headlines for being signed to a mainstream modelling agency. At around size 22-24, she is the largest plus-size model to be signed with a major agency. Tess Munster embraces a retro/pin-up/rockabilly style and is famous for her amazing makeup (she is a makeup artist by trade) and her prominent tattoos. She’s also famous for starting an online movement with the hashtag #effyourbeautystandards because she revels in the act that Catherine Deveny describes. She exists in a society with a narrow definition of beauty and she doesn’t fit the mould and if that’s not bad enough- she has the temerity to not hate herself for it. 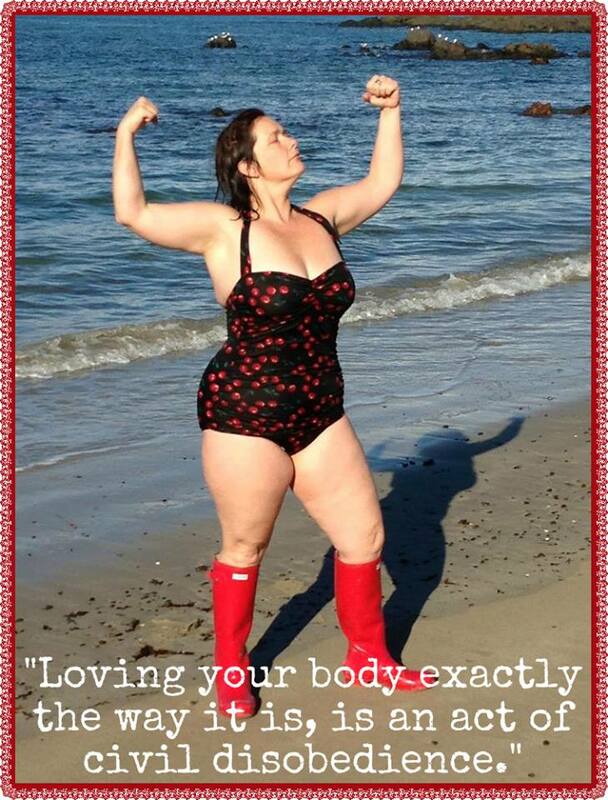 In fact, Holliday is a passionate advocate for body positivity and for reminding us that our size does not define us. She refuses to discuss health beyond pointing out that fat doesn’t always mean unhealthy and she’s correct. Just like thin doesn’t always mean healthy. Her recent success has been widely reported and while many people are overjoyed for her and can see the positive message she projects however, as expected, many people have simply taken the opportunity to express their concerns. The most common response in this light is to make assumptions about Holliday’s health and to frame these assumptions as concerns for her wellbeing. Firstly, unless you are Tess Holliday or her doctor, you don’t actually know much at all about her personal health. Secondly, her health is no one else’s business. Even if you feel your concerns are well-intentioned, you don’t really have any right to raise them with a stranger. I found an excellent blog post that expresses what I think about this far better than I can here. 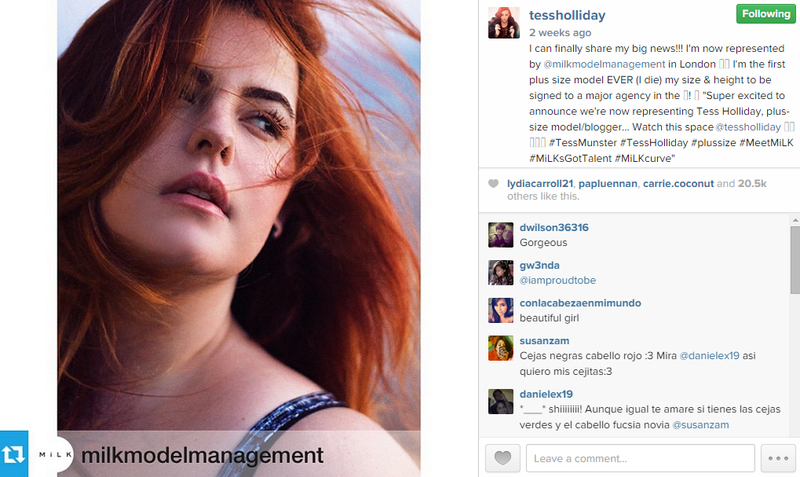 Another common worry that I have seen expressed is that Tess Holliday is promoting obesity. I have scoured her blog and news articles about her and her social media and I cannot find any point in which she actively tells other people to be obese. Other than being large herself I literally can’t find her actively promoting obesity anywhere. It’s not like that time supermodel Kate Moss said that “Nothing tastes as good as skinny feels” was one of her personal mottoes– if you aren’t familiar with the expression it’s hugely popular on pro-anorexia blogs (yep, that’s a thing). Tess Holliday makes no bones of the struggles she had in overcoming how she felt towards her body. She’s now in a place where she feels love for herself and her body, even though it’s outside the narrow confines of beauty that our media constantly reminds us of. 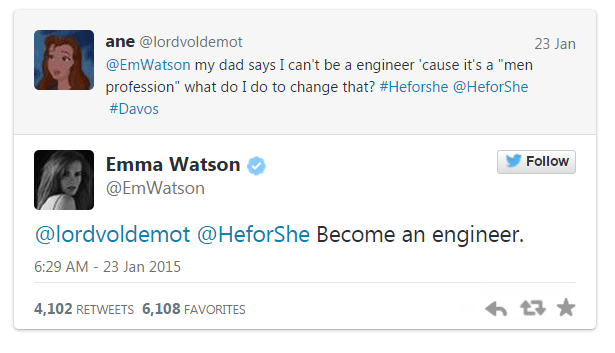 As a role model, I’d say she’s pretty bloody good. Getting behind the #effyourbeautystandards ideal doesn’t mean you stop improving or maintaining your health. What it means is loving the body you have RIGHT NOW- whether it’s a work in progress or a finished piece. That sort of self-love is something we could all benefit from. If we treat ourselves to that level of kindness, perhaps it won’t be so difficult to extend it to others. And linking with Maxabella Loves for Weekend Rewind.